Archaeologists are sometimes faced with the problem of finding or detecting things they cannot see but which they suspect are at a site. In some cases they turn to geophysical methods to locate such objects, the most common being structures, monuments, tombs, pottery, habitation sites or, in marine areas, ships or a ship's cargo. My involvement in this subject stems from my specialization in using a particular geophysical instrument, a magnetometer, to find objects under the sea and under the earth, which I have done for many years for a variety of objects--some fascinating, some mundane, and most surprising to the lay person that they can be located with a magnetometer. Perhaps the most common geophysical tool in these searches is a magnetometer. Being a geophysicist specializing in the use of magnetometers for oil and mineral exploration from aircraft, ships and on the ground, I have made it a specialty of mine to develop methods and experience using magnetic exploration for archaeological exploration and for the search of other objects, some important and some not . 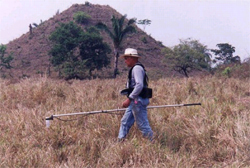 One of the most interesting and spectacular examples, in my experience, of the application of magnetometers to archaeological exploration was a project to find monuments of the Olmec civilization, colossal heads, altars, stelae most of which remained buried at the archaeological site of San Lorenzo in the remote rain forests of Southern Mexico for 3,000 years. The Olmec are probably the oldest civilization, but very little is know about these people, especially compared to the Mayan. 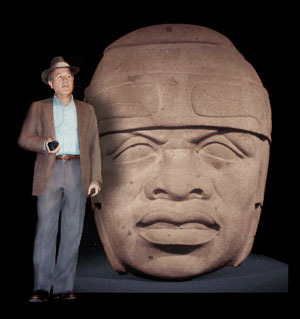 An important exhibit of the Olmec culture was held at the National Gallery, in Washington, D.C., in 1996 when the Mexican government loaded many of the most studied pieces from various museums in Mexico. Included was the colossal head pictured here, which I mapped and detected magnetically and which was then excavated. I presented a talk at the Smithsonian as part of the exhibit program to describe the mapping and discovery of over 100 such monuments using magnetic surveys. To give you a better idea of the background on this discovery and technology that led to the discovery of this head and many other objects, read the technical article in American Scientist Vol. 60, No. 5, Sep-Oct, 1972 which I wrote with Michael Coe. The photo album on this website entitled, "Indy finds lost civilizations" shows scenes of the jungle giving no hint as to what or where something might be buried; the magnetic anomaly map derived from months of painstaking traverses through the jungle with a portable magnetometer indicating a large object at a depth of 20 feet; and a photo of the head exposed in the pit. 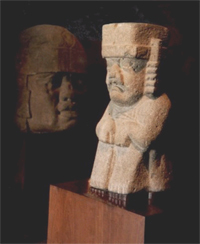 The head is on permanent exhibit as the theme piece of the Museum of Anthropology at Jalapa, Veracruz, Mexico. It is prominently displayed in the giant atrium at the entrance of this beautiful Edward Durrell Stone-designed museum built in 1985. 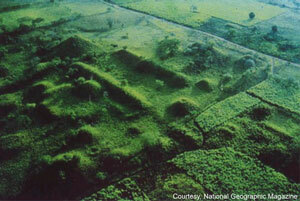 I directed the geophysical exploration at San Lorenzo over a three year period to find tens of large monuments. As many as one hundred were identified through the magnetic surveys, most of which remain buried and unidentified owing to lack of funds. Among the more important finds were the were-jaguar figure pictured here now at the entrance of the Olmec exhibit at the famous Museum of Anthropology and History in Mexico City, and many others, such as a 20-ton altar and other objects whose significance have not yet been established. Over the years I have been involved in such 'objects of search' as hydrogen bombs, sunken U.S. and Russian submarines, historic ships, undersea pipelines, aircraft flight recorders, weapons, tunnels, treasure ships, and tombs. The more popular searches in which I have been involved include many archaeological sites such as Atlantis, the discovery of Sybaris, a 2,500 year old famous Greek city completely buried 20 feet under the surface in Southern Italy (see the article from Science). I have worked with people who discovered treasure ships in the Caribbean, Gulf of Mexico, Atlantic and even Drakes Bay, California, where I found sherds of Ming Dynasty china on the beach from a 400 year-old shipwreck I was commissioned to locate by the National Park Service. © 2012 Sheldon Breiner All Rights Reserved.